Live in luxury in a paradise far away from home! Package is based on Singapore Airlines promotional air fares and subject to availability at time of booking. Above fares are subject to changes with or without any prior notice. Confirmation are subjected to seats & hotel availability, Rooms are based on twin sharing. Please ensure passport is valid for at least 6 months from travel period. Maldives is home to one of the best diving sites in the world. 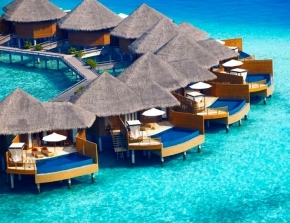 Visit Maldives and enjoy its spectacular clear blue waters, amazing marine life and beautiful coral reefs. Relax in this paradise away from home with its sunny tropical weather all year round. Paradise Island Resort & Spa offers private villas and bungalows on an idyllic island in the Indian Ocean. The resort features an outdoor pool, 4 restaurants and a spa. Guest units come with air conditioning, tiled flooring and a private terrace with serene ocean views. Amenities include satellite TV, a safe and a refrigerator. A tea/coffee maker is provided. 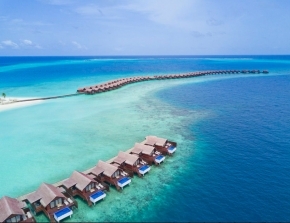 The Paradise Island Resort & Spa is a 20-minute speedboat ride from Malé International Airport. A mandatory transfer is provided by the resort, and charges are to be paid upon arrival. The resort features a fitness centre and tennis courts. Snorkeling and diving equipment is available. The resort provides bicycle rental and a tour desk. The resort’s restaurants offer a variety of cuisines, including Italian and Japanese. Beverages can be enjoyed at the Beach Bar and the Karaoke Bar. The Paradise Bar features live bands, a DJ and a dance floor.